I’ve been experimenting with something in my teaching lately and I’m excited about the results. It’s my favorite kind of experiment because it requires absolutely nothing… literally. I want my students to feel successful and comfortable in their piano lessons. But I recently realized I was assisting them maybe a bit too much. It was my outspoken 7-year-old little guy who brought this to my attention. He made a mistake and hesitated, and I hopped in to immediately help him. But he looked at me with his big brown eyes and said: “My brain didn’t have a chance to fix it yet.” How very astute. His words made me think. Was my desire to help and maintain his confidence interfering with his learning processes? Was I robbing him of the opportunity to make “brain wrinkles” by feeding him the answer too quickly? It was a simple adjustment to make, and so for the rest of my teaching day, I started using my new-found four-second rule. 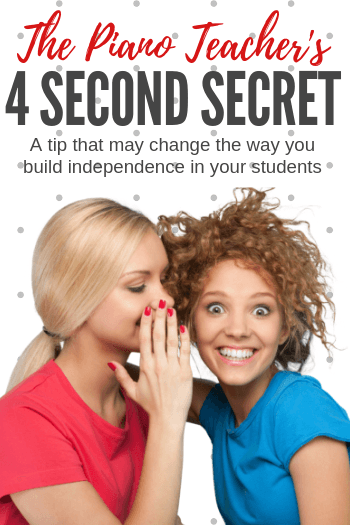 Four seconds sounds short, but as you sit beside a student who is hesitating it’s actually just enough time to assess if a) they are going to figure it out on their own or b) if they’re going to continue to flounder and truly do need help. What was interesting to me was, more often than not… they didn’t need me. Those 4 seconds passed, their brain worked away and they corrected the mistake or broke through the stumbling block. And what was even more impressive was that the next time the same instance occurred in their music they breezed through it without a second glance (usually)… something I couldn’t always say for an “assisted fix”. For some students, the 4-second silence was somewhat unnerving – and, as you might have guessed, it was these students who always “needed me” the most. They immediately looked to me for assistance instead of focusing on their thought processes. But my kind smile and nod of silent encouragement were enough to re-direct their thoughts from needing me to using their own skill set to figure it out. Eventually (rapidly) they stopped looking to me for help. Eventually (rapidly) they became more confident piano students right before my eyes. When you consider the fact that our students practice with “silence on our part” at home, it makes complete sense that I should be giving them these same tools in their lesson time. Well-timed silence… followed by my encouragement and assistance if needed… is doing just that. We’re full of helpful secrets around here. Check out our resource, Shhhh… Your Piano Teacher Thinks This Is Practice. It might be the secret to your students’ practice problems!